The low-fat era is over! We now know that the type of fat we eat is more important than how much fat we eat. One place where my clients often get stuck is that they like the convenience of margarine, being able to spread it straight from the fridge. Ingeniously Coco Olive Spread solves this problem, and it is so easy to make too …. Sterilise a glass jam jar with boiling water and leave to one side to allow to cool. Meanwhile boil the kettle and fill a saucepan with the hot water. Place a ramekin full with coconut butter ontop of the water. Wait while the coconut butter gently melts. 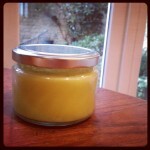 Once melted pour into the sterilised jar, and top up with an equal quantity of olive oil. Stir until well mixed. Once cool, place in the fridge to set. Natural, healthy fats that can be spread straight from the fridge! Perfect served with a nut butter on (my favourite) toast, ABO organic linseed bread. The best gluten-free loaf I have ever seen. This entry was posted in Front Page and tagged coconut, Fats & Oils, gut health, Inflammation, Paleo, Recipes. Bookmark the permalink.